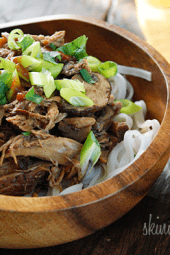 Boneless pork roast slow cooked in Asian spices creates a aromatic pork dish with mushrooms and broth, perfect over noodles or rice with fresh chopped green onions, cilantro and sriracha. 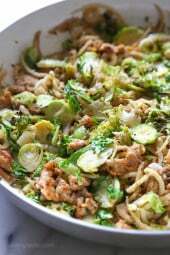 Try this over cilantro lime cauliflower rice or brown rice. I’m liking my crock pot more and more lately because I am understanding how to make it work and what not to do from some crock pot disasters in my past. Food cooked in the crock pot is blander than dishes made on the stove. To compensate, I learned to boost the seasoning and I usually have to add more at the very end to taste. Fresh herbs should always be added at the end of cooking. 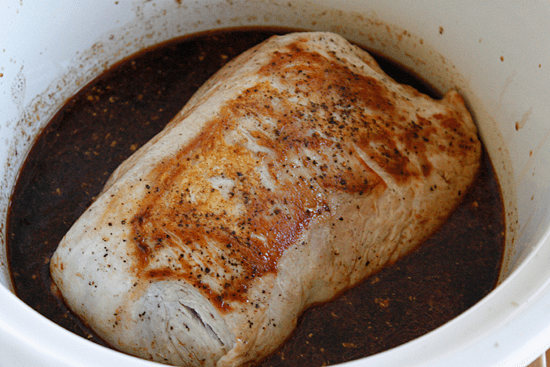 Searing the pork before adding it to the crock pot is a must, so don’t skip this step. If you want to do this the night before, you can set it all up and leave it refrigerated, then turn it on in the morning. Because this makes a lot, I enjoyed this two nights with leftovers to spare. The first night we enjoyed it over rice noodles, soba or buckwheat noodles would also be great. The second night, I reheated some of the pork and broth on the stove and threw in some handfuls of baby spinach and let it wilt. 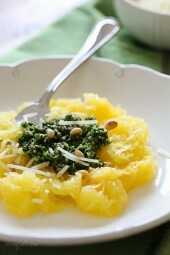 We had this over rice and my husband couldn’t stop raving. 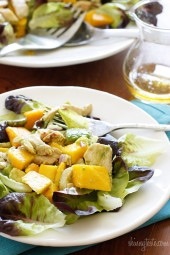 Next time I make this I will try adding chopped carrots, baby corn, or bok choy in the end for extra vegetables. A few notes about the ingredients: I always buy sesame oil with cayenne at the asian grocery, it’s infused with cayenne and very spicy. If this is something not available to you, use regular sesame oil and add a pinch of cayenne or red pepper flakes instead. Chinese five spice is available your spice aisle, it’s an exotic combination of anise, star anise, cinnamon, cloves and ginger, great for marinades in Asian dishes. I love the rich warm flavor it adds to this dish. Season pork on all side with salt and fresh cracked pepper. 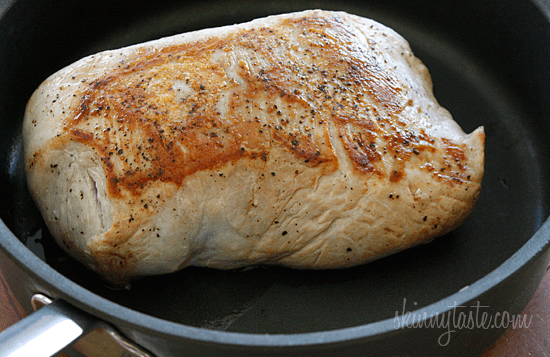 Heat a skillet on medium-high heat, spray with a little oil and brown the pork on all sides for about 7 – 8 minutes. 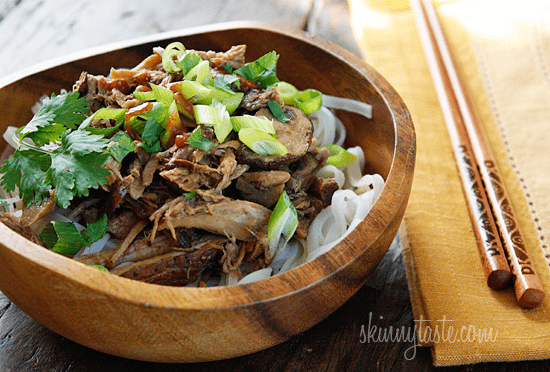 In the crock pot, combine the broth, soy sauce (or Tamari), balsamic, agave, sesame oil, Chinese five spice, garlic and ginger; add the pork and set the slow cooker to 8 hours on low. Thirty minutes before the timer goes off, remove the pork and set aside to rest a few minutes; add the mushrooms to the crock pot, cover and cook on low for 30 minutes. Meanwhile, shred the pork using two forks. 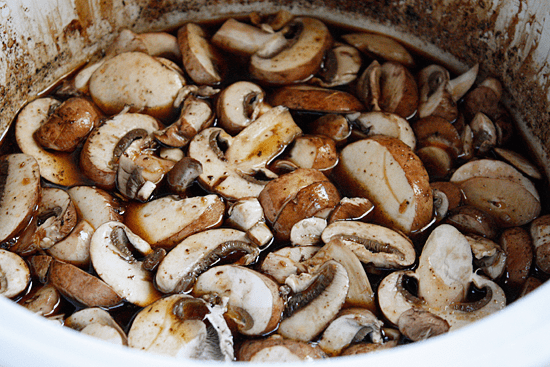 When the mushrooms are tender, remove about 1 cup of the broth and reserve if needed. 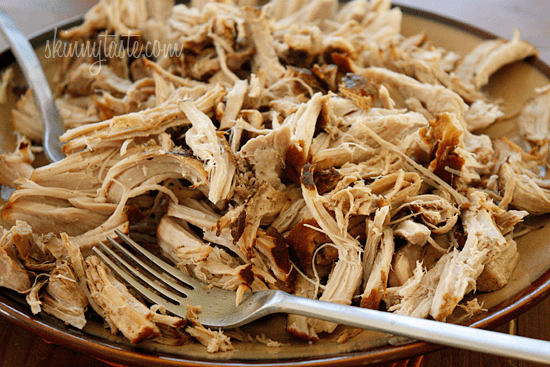 Add the shredded pork to the crock pot and mix well. If adding baby spinach, add at the end and cover a few minutes until it wilts. Soduim calculated since you don’t use all the liquid. If I want to halve this recipe, how would this affect the cooking time? When I imported this into fitness pal, it said the calories were 491. The pork loin was the biggest calorie item totaling 1596 for a two pound loin. Am I missing something? I made this tonight. It’d awesome! So good. I’ll be making this more often. One of my favorites! Do you have an instant pot version? I’d love this one converted for Instant Pot, also. I ditched my crock pot once I got it. I’d love an instant pot version as well!